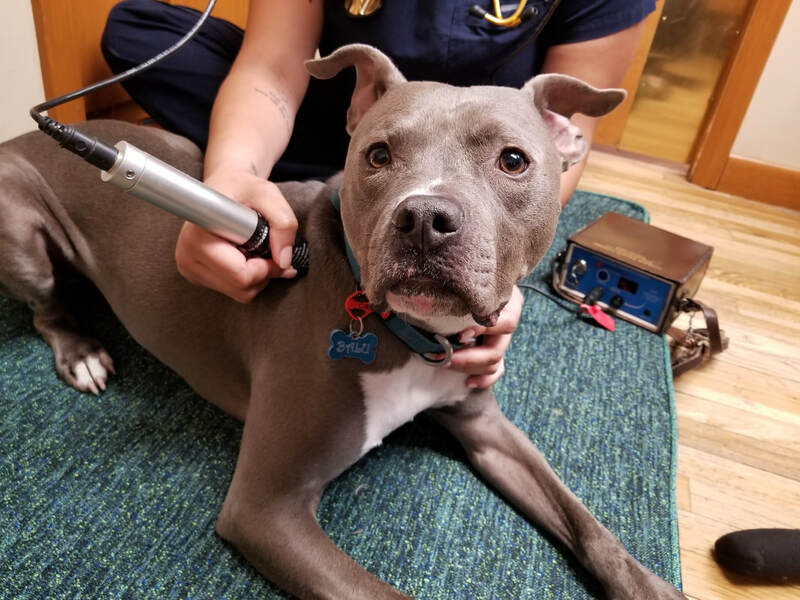 ​​Laser Therapy is a sterile, pain-free, surgery-free, drug-free treatment option that can be a valuable pain management tool for dogs and cats. At MASH, we offer class IV therapeutic laser therapy. Laser therapy is a non-invasive localized treatment in which light energy is emitted deep into tissues without damaging them. All the pet feels are soothing warm sensations and often becomes relaxed during treatments. This light energy causes vasodilation and increases lymphatic flow. It stimulates the production of collagen and increases tissue repair by affecting tissues on a cellular level. The cells are stimulated to produce more ATP – think of this as fuel energy for a cell. This fuel is responsible for cellular repair and rejuvenation. When tissues are damaged, they don’t produce ATP at an optimal rate, decreasing healing time. Applying laser to impaired tissue will dilate blood vessels and increase the lymphatic flow. This increase helps to bring more nutrient carrying blood to the area and flushes out the inflammatory cells, leading to decreased pain and swelling. What can Laser Therapy do for my pet? ​​Laser therapy is ideal for age related disease, acute and chronic disorders, rehabilitation and wound healing. It can easily be performed alone or in combination with acupuncture, PEMF (pulsed electromagnetic fields) and supplements for a multimodal pain management program that is tailored to your pet’s individual needs. ​We recognize that your pet is an important member of your family and our caring, compassionate team is focused on optimizing your pet’s health. From well visits to chronic disease, we assess the whole pet so we can offer therapies that respect the integrity of your pet’s mind, body, and spirit.